An herbaceous annual, the potato, solanum tuberosum, is a member of the nightshade family of plants that include tomatoes and eggplants. The plants produce tubers underground. They rank as the world's fourth most important food crop after corn, wheat and rice. The tubers are rich in carbohydrates and contain the most protein of any root or tuber crop. A medium size tuber contains almost half of the daily recommended amount (RDA) of vitamin C and a fifth of the RDA of potassium. It is believed that they were first cultivated in the area of Lake Titicaca on the border of present day Peru and Bolivia around 8000 years ago. It was brought to Europe in the 1500's by the Spanish conquistadores and quickly spread throughout the continent and from there, the rest of the world. The potato is also a very adaptable plant and will grow in less than perfect soil, but as with any plant, the better the soil, the more they will produce. They are susceptible to several garden pests and diseases and proper plant rotation is essential to prevent build up of pathogens in the soil. Avoid the planting of tomatoes in succession with them as they are bothered by some of the same diseases. A major pest is the Colorado potato beetle. They can be controlled by destroying beetles, eggs and larvae that appear early in the season. Proper sanitation, using resistant varieties and crop rotations help keep the nematode population down also. A major disease that affects these plants as well as their cousins, Tomatoes, is late-blight disease. This is a soil-borne disease that can live from year to year, so proper sanitation is necessary. Avoid putting the vines from either of these plants in your compost pile and always purchase seed potatoes that are certified to be disease free. They are not grown from seed. Rather they are grown from seed potatoes, small tubers or pieces of larger potatoes cut up and each containing a sprout or "eye." We've all had them start growing in the pantry and may have planted some of these as an experiment. Many grocery store potatoes have been treated with growth inhibitors that will keep them from growing properly. 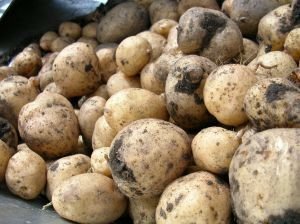 The best results are achieved with buying seed potatoes from a reputable source. As with any "seed," the seed piece provides the initial nourishment for the plant, so the seed pieces should be around 2 ounces to grow strong plants. Seed pieces from larger tubers should be cut 5 to 6 days in advance of planting. This will allow the cut surfaces to dry over and helps prevent rotting. They are planted at a depth of two to four inches. The rows of plants should be spaced far enough apart to allow for the soil between the rows to be drawn up. The plants have a relatively shallow root system and all new tubers are produced above the seed tuber. Hilling or ridging of soil around the plants will encourage root growth and tuber production. Because of the shallow root system, your plants will need to be watered frequently. Depending on variety, the tubers reach maturity in 90 to 150 days. They like temperatures between 50 and 85 degrees and grow best in temperatures in the mid to upper sixties. There are some variations on the standard method of growing outlined above. Some gardeners use heavy mulch around the growing plants instead of drawing up soil. Others have used vertical containment systems consisting of old tires, wire mesh, raised bed frames or anything that will contain soil. These methods can make harvesting easier for gardeners that may have problems digging and bending over to harvest. They can also result in larger, better formed tubers if you have tough soil conditions. Mulching also helps to reduce soil temperature and thereby increases yields. This video, made by Carol Buie-Jackson shows one of these methods. She updates her experience on her "Smell Like Dirt" blog. Like most crops, your potatoes will benefit from even, steady watering. Side dressing applications of a balanced fertilizer during the growing season are also recommended, adjusting for any nutrient deficiencies revealed by a soil test. They also like the soil to be slightly acidic. When the tops of the plants start to turn yellow and the tubers separate easily from the roots, they are ready for harvesting. For better storage the tubers can be left in the ground after removal of the plant tops for a week or two as long as there is no chance of freezing. This will thicken the skins. After harvesting, gently wipe any excess dirt from the tubers and put them in a cool place for a week or so to allow any damage from harvesting to heal over. The tubers can then be cleaned up a bit more and placed in storage in a cool, not too dry, dark place.